I ran across InstaGrok last week and fell in love. InstaGrok is an “intelligent web search engine” designed to help you find educational content. It’s gonna help find online materials on most educational topics and at different knowledge levels. A ton of educational materials is scattered across the web, yet they are often difficult to find using general-purpose search engines like Google – there’s just too much stuff. 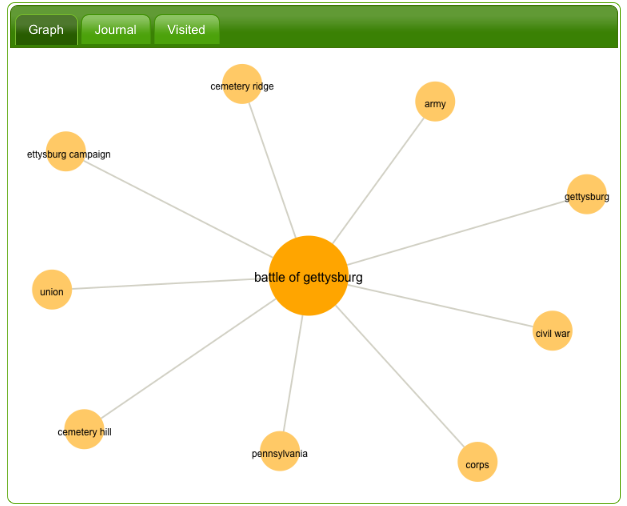 A simple Google search of Battle of Gettysburg, for example, returns over 2,750,000 hits. And because the stuff you find can vary widely in scope, style and intended audience, it is not easy to measure the suitability of the results, to easily assess whether the material is basic or advanced, or to know which concepts are important to know, especially on an unfamiliar topic. If you’ve ever used the very cool online dictionary, Visuwords, you have a sense of how InstaGrok works. I especially like the quiz questions that are automatically generated and the ability to find a variety of resources by using the sorter on the right hand side. I also appreciate the ease of the complexity slider at the top of the screen – one side is a chalkboard and the other is Albert Einstein. Simply slide from one end to other to get less or more complex information and materials. I still like Google. But InstaGrok is going to get some work too. have you ever tried Macroglossa ( http://www.macroglossa.com ). A real visual search engine to compare images.